+ Can I have my plumber turn off my water at the curb box? No, the curb stop at your front property line belongs to the Queensbury Water Department. No one else is authorized to turn on or off your water connection. If you have an emergency call 518-793-8866 to request that someone come to your home to turn the water off. + Can I install my own service line? 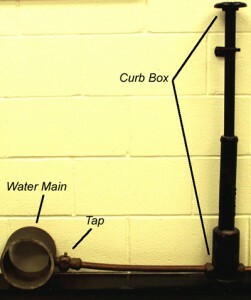 It is your responsibility to install the copper water service on your property from the property line into your home. You may hire a contractor or do the work yourself. The service must be type “K” copper and be a minimum of 5 feet deep. The work must be inspected by us prior to backfilling. Our hours for inspections are Monday – Friday, 7:00 A.M. – 2:30 P.M. Please call 518-793-8866 to request an inspection. + How do I apply for a new water service? You may apply for a new water service by completing a water tap application at our offices at 823 Corinth Road, Monday – Friday from 8:00 – 4:30. This is a simple one page form that can be completed while you are here. An application for water service greater than 2 inches in diameter is available. + I am installing a new lawn irrigation system. Are there any special requirements? All water must be metered. Backflow protection must be installed on the waterline that supplies your lawn irrigation system. You must install one of the following: an atmospheric-type vacuum breaker, a pressure-type vacuum breaker, or a reduced pressure zone device (RPZ). This will protect both your health and safety as well as your neighbor’s from any cross connection. + My water meter is located outside. Why do you need to get into my house? Unless you have a meter pit your water meter is located inside your home. Older meters have a wire leading to an outside reader, but the actual measuring device is located inside. To update your meter we must have access to the actual meter not the outside reader. + There already is a water service on my property. Is there any fee? + What are the costs for a new water service? The tapping fee for a new water service is based on the table below. This fee includes the cost of the tap, copper line from the water main to the property line and the water meter. 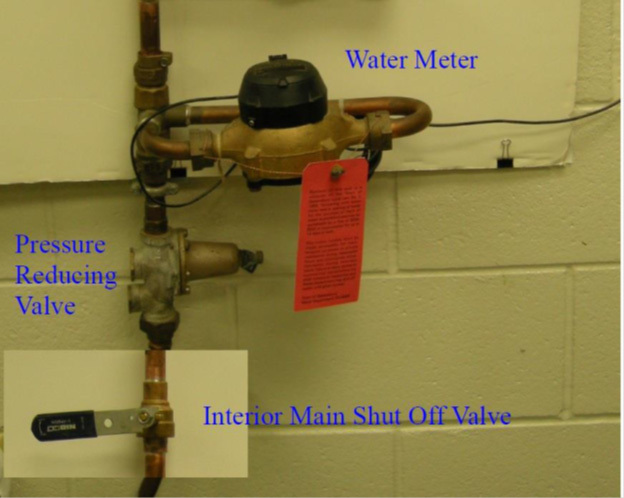 Customers are responsible for the installation of the water service from the property line into their home, a shut-off (ball) valve, a pressure reducing valve (if necessary), as well as any plumbing changes that may be necessary to install the water meter. + What are the costs for meters? The cost for a water meter and installation is included in your water tapping fee. 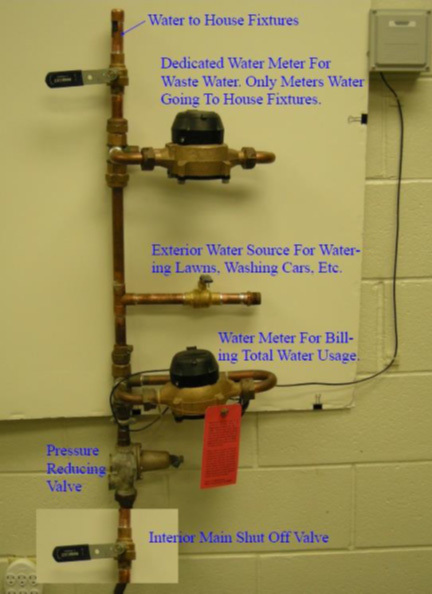 Any upgrade to a radio read style of an existing water meter size is at the water department’s expense unless you have damaged the meter or allowed it to freeze and break. If you have damaged the meter, it will be replaced and you will be billed for a replacement. + What information do I need to have to apply for a water service? You will need to bring with you the following information: owner’s name and mailing address, contractor’s name and address, phone number, location of service, nearest intersections, and tax map number. Tax map numbers typically can be found on property deed information or building permits. + What is a dedicated sewer meter? In some Queensbury Wastewater Districts, you are billed for sewer service based on your water meter readings. Unless you have arranged to have a dedicated sewer meter installed you will be billed quarterly based on all water consumption, including water that you use to irrigate your lawn. You may arrange to have us install a special meter, in addition to your existing water meter, that will be used only for sewer billing purposes (i.e. consumption within your home). This meter is installed by us at your expense. Please call 518-745- 5589, Monday – Friday, between 8:00 A.M. – 4:30 P.M. with questions or to arrange for a pre-plumbing inspection for a dedicated meter. + What is a radio read meter? In the Queensbury Water District all water use must be metered. Since 1999, the town has been installing water meters with a radio read device. This allows us to directly read the meter from the street. To upgrade the water meter to a radio read device there is no charge to the property owner. The water meter is connected to a transmitter that we supply. The transmitter is mounted to the register of the meter. 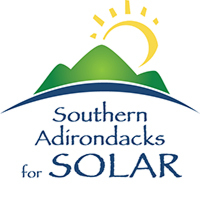 Please call 518-745-5582, Monday – Friday, between 8:00A.M. – 4:30 P.M. to arrange for the installation of a radio read meter. + What type of shut off valve do I need? You must have a water shut-off valve immediately after the water service enters your home. This valve is your protection in the event you must shut off the water in an emergency. Any new or replacement shut-off valve must be a ball valve. + Why do I need a pressure reducing valve? In some areas of the Town of Queensbury the pressure in the water mains may exceed 130 psi. The New York State plumbing code requires a pressure reducing valve in any situation in excess of 80 psi. 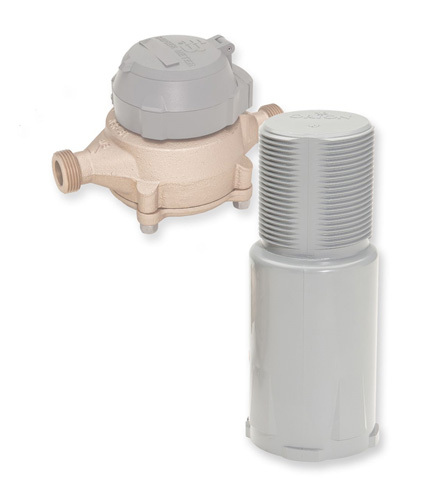 This pressure reducer will protect your plumbing as well as our water meter. If you have a question whether your area needs a pressure reducing valve, please call 518-745-5582, Monday – Friday, between 8:00 A.M. – 4:30 P.M.